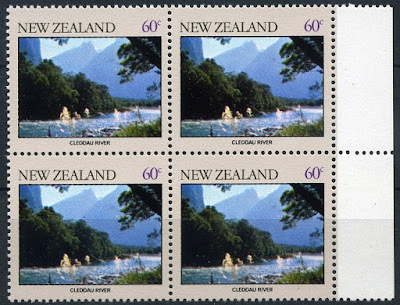 1981 Scenic Stamps - Rivers. 30c - Kaiauai River. 35c - Mangahao River. 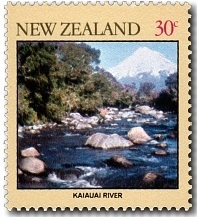 The Kaiauai River, also known as the Kaiauai Stream, is one of the many streams radiating from Mt Egmont /Taranaki, featured in the background of this stamp. The actual source of the Kaiauai is between Egmont and one of the two secondary volcanoes, now appearing as much eroded remnants, which form a shoulder on Egmont's northern slopes. It can be reached via the popular Pouakai Circuit walking track, where hikers often stay overnight at the Kaiauai Hut. 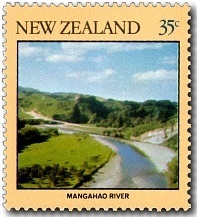 Like most large New Zealand rivers and streams, the Mangahao is stocked with trout. The river rises in the Tararua mountain range, flows down the eastern side of the mountains, then flows north-eastward through farmland into a major North Island river, the Manawatu. 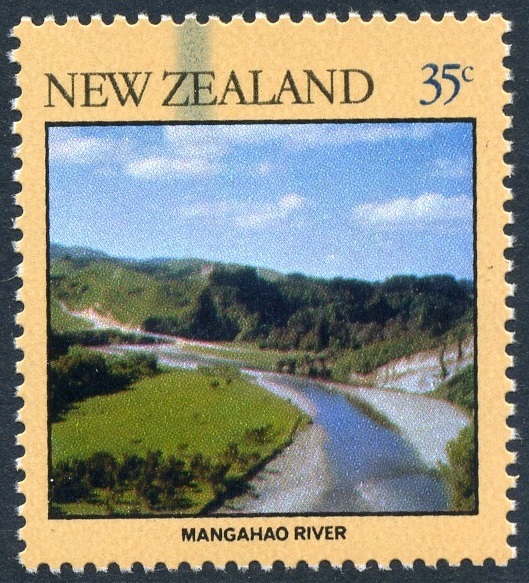 There are two dams on the river which tunnel water, via a third reservoir on the Tokomaru River, to the Mangahao Power Station located on the Mangaore Stream near Shannon. Mangahou and not Mangahao is the correct Maori name for this river. Many pioneers found difficulty with the pronunciation of Maori place names and in time corrupted pronunciation such as this passed into written form and common usage. 40c - Shotover River. 60c - Cleddau River. 40c - Shotover River, Otago. 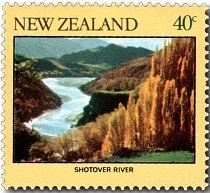 This stamp depicts the Shotover River flowing south between the Coronet Range (at rear left) and Brown Peak (rear centre) in the Otago Province. The name correctly suggests that this 75 kilometre-long river is fast flowing, with numerous rapids. The river flows generally south from the Southern Alps on its journey running through the Skippers Canyon, draining the area between the Richardson Mountains and the Harris Mountains, before flowing into the Kawarau River east of Queenstown. Although unsuitable for fishing, the river attracted thousands of people in the 1860s when gold fever struck. The Shotover was to yield some fabulous returns, and a tributary of the Shotover, Skippers Creek, became known as the richest creek in the world. Today the river is used for commercial white water rafting trips and jet boating rides which operate out of the nearby tourist resort of Queenstown. 60c - Cleddau River, Milford. Over several mountain ranges to the west of the Shotover lies the Cleddau River which flows north-westward into Milford Sound. The area is well known for its breathtaking alpine and fiord scenery, attracting tourists from all over the world. This river runs from Homer Tunnel down the steep Cleddau Valley and comes out in to the sea at Milford Sound in Deep Water Basin. Summer is rock climbing season in the Darran Mountains, just east of Milford Sound via the Cleddau Valley. Some climbers make an annual pilgrimage to the area to climb the amazing granite walls in the valleys while they are free of snow. Left-Hand Stamp - 1981 Rivers 35c Mangahoa with blue Dr Blade flaw at the top. 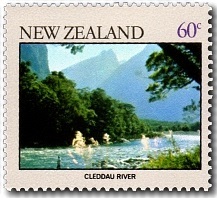 Right-Hand Block - 1981 Rivers 60c Cleddau River, stamp has yellow omitted or partially omitted. The Trees appear more blue than green. 1981 Rivers First Day Cover - Unfortunately it has not been addressed. 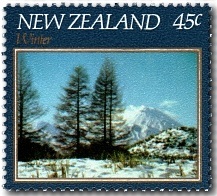 1982 Scenic Stamps - Four Seasons. This issue differed from previous scenic issues in that it showed the four seasons of New Zealand rather than just four scenic views. 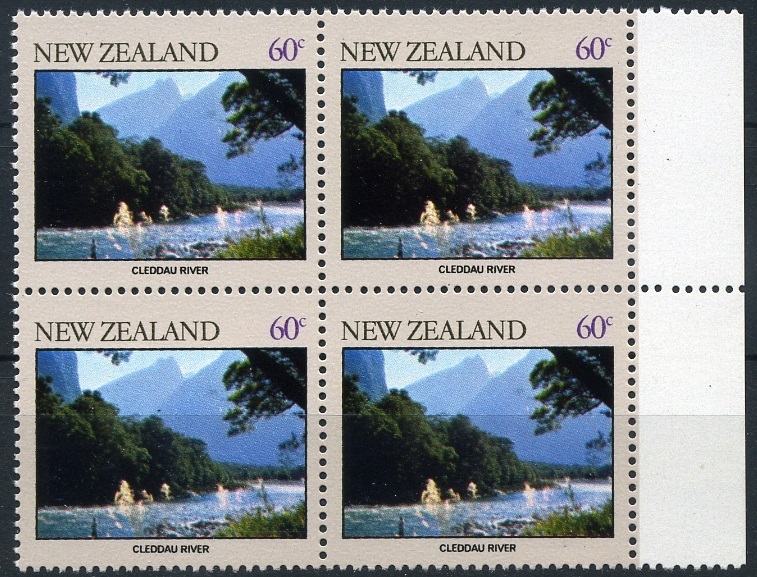 The four stamps showed four scenic scenes but their subjects were unrelated other than the season theme. 35c - Summer. 40c - Autumn. 35c - Summer / Kaiteriteri Beach, Nelson. 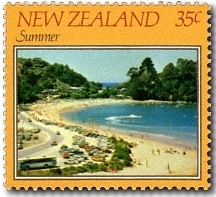 This scene shows Kaiteriteri Beach near Nelson. The beach is a popular resort attracting many tourists each summer. 40c - Autumn / Saint Omar Park, Queenstown. St Omar Park, Queenstown, which is situated on the shores of Lake Wakatipu, represents the colours of autumn beautifully. 45c - Winter. 70c - Spring. 45c - Winter / Mount Ngauruhoe, Tongariro National Park. The snow-capped Mt Ngauruhoe features on this Tongariro National Park scene. This mountain is 2291 metres in height and is the most continuously active of New Zealand's volcanoes. 70c - Spring / Lambing on a Wairarapa Farm. 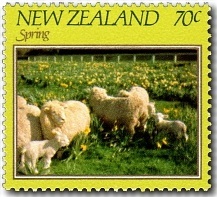 Spring is represented by a scene on a Wairarapa farm just after lambing- depicting new born lambs and their mothers grazing among brightly coloured daffodils in a lush green pasture. 1982 Seasons First Day Cover. 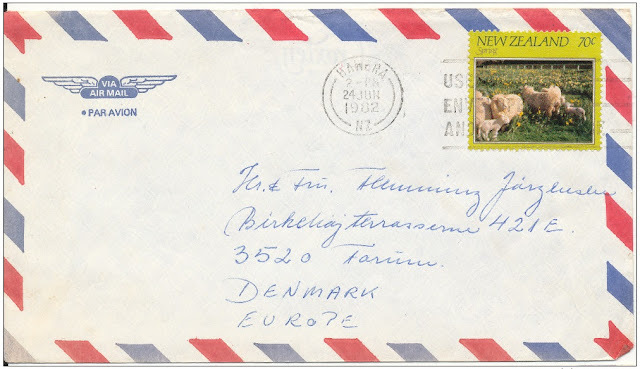 Below are two airmail covers sent overseas useing the Seasons Issue stamps. 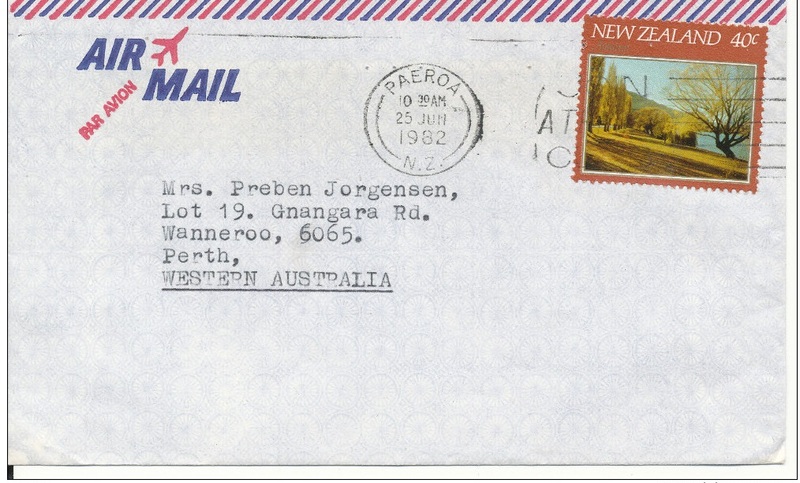 The first was sent to Denmark using the 70c stamp and the second was sent to Perth, Western Australia using the 40c stamp. New Zealand air mail cover sent to Denmark 24-6-1982. New Zealand air mail cover sent to Western Australia 25-6-1982. Technical information - 1981 Rivers. Technical information - 1982 Four Seasons. 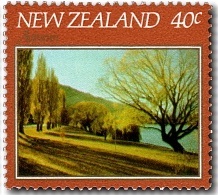 1983 - 1984 Scenic Stamps.